From: £150 -£250 for one or two hours depending on distance to gig. Perfect for your Children’s Birthday Party, Special Event, Community Day, Family Fun Day, Christmas Party etc. Skinny offers either a one or two hour party with his Show plus Balloons, Games and Dancing. 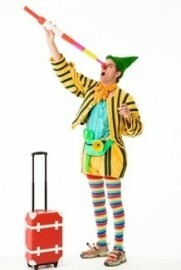 The Show is an Hilarious mix of Circus Skills, Magic and Comedy. Skinny’s mysterious invisible dog, woof! Generally th ... e show lasts around 45 minutes and has been performed in a wide variety of settings, from The 2000 seater Reds venue at Butlins Family Entertainment Resort to the living room of many a happy 6 year old. The Show is followed by a wild and wonderful Balloon Model for all the children, taking another 15 -30 minutes depending on the number of Children, (This is often done as they eat their tea). Finally for the two hour option Skinny, using his self contained PA system will lead all the children in a session of party games and party dances. Or upon special request and if the venue is appropriate Skinny can teach Circus Skills; Plate Spinning, Diablo, Feather Balance, Ball and Scarf Juggling. He can also bring his Colourful Parachute for bigger groups and venues. Skinny Bean started out in 1992 entertaining the queue lines for Madame Tussaud's and has since gone on to have a very varied career entertaining for a wide selection of clients: Butlins, Disney, Warner Brothers, Legoland, The London Eye, Chessington World of Adventures, etc etc. 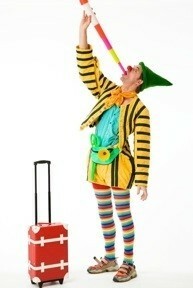 In demand from the top entertainment companies, Skinny is a top class children's entertainer.